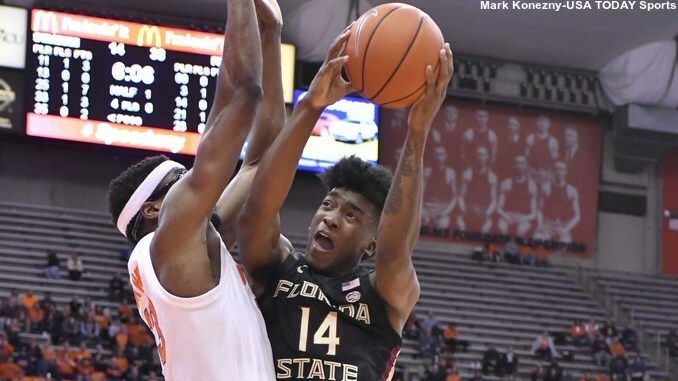 While they fought back from the bad end of a 30-7 first half run, Syracuse could not survive a dozen straight Florida State points in the second half and fell at home, 80-62. The Orange (16-7, 7-3 ACC) posted a big run late in the first half and another after the break, but the #22 Seminoles (16-5, 4-4) blew open a three-point game while holding SU scoreless for over four minutes just past the midpoint of the second half. The FSU offense was unstoppable at times and finished the night shooting 54.5 percent from the field and 50 percent from beyond the arc, amassing 25 assists on 30 field goals. The ‘Noles hit 7-of-9 triples in the game’s opening 12 minutes and posted 29 fast break points. Syracuse shot just over 41 percent on the night, including making one-fourth of their long range shots. Down a single point early in the game, Florida State hit 12-of-17 shots, resulting in a 30-7 run. In less than nine-and-a-half minutes, the guests went from trailing to owning a 36-14 stranglehold. The Orange responded with a dozen unanswered points that keyed a 17-3 run over the rest of the half. Tyus Battle sprinted past the FSU defense for a fast break lay-in, then swished a pull-up. Oshae Brissett rang up a three-point play and Buddy Boeheim connected from below the top of the key. Elijah Hughes curled for a triple to make it a 36-26 game. Battle matched a Seminole triple and added a pair of foul shots with 3.9 seconds left, bringing SU within 39-31 at intermission. FSU nudged their lead out to nine points early in the second half, but Syracuse responded by scoring 12 of the night’s next 16 points. Brissett notched another three-point play, then Battle made a steal and raced for a lay-in to make it a four-point game. Boeheim added a drive that banked in high off the glass and Hughes canned a three from the left wing. Brissett then cleaned up a miss to pull the Orange within 46-45 just over six minutes into the second half. Florida State extended their lead back out to a half dozen, but Hughes was fouled on a three-point try. He made all three free throws to bring SU within 55-52 just before the midpoint of the second half. Unfortunately, those were the last Syracuse points for four minutes. Meanwhile, the ‘Noles added a pair of dunks, a pair of threes, and a pair of foul shots, opening up a 67-52 lead with 6:25 to play. The margin would never again see single digits, as seven straight FSU points after the four-minute mark would snuff out any SU comeback hopes. Only four players scored for the Orange, led by Tyus Battle’s game-high 23 points. Elijah Hughes connected on four threes as he added 17 points. Oshae Brissett rang up a 16-point, 12-rebound double-double. Terance Mann topped the Florida State attack with 22 points. Mfiondu Kabengele went 7-for-10, including a perfect 4-for-4 from deep for 18 points. Phil Cofer and M.J. Walked each added 11 points. The next contest on the Orange slate is the return game with Boston College at the Carrier Dome on Saturday afternoon. The Eagles (11-10, 2-7) are on a three-game slide, including an 80-55 loss at #2 Duke Tuesday night. BC’s slide started when Syracuse won in Chestnut Hill a week ago, pulling out a 77-71 victory on the strength of shooting nearly 56 percent from the field. Battle had a huge night, pouring in 31 points. Ky Bowman and Jordan Chatman each had 21 points in the first matchup of the two squads, canning seven treys combined. Bowman leads the Eagles with nearly 21 points and eight rebounds per game. Saturday’s SU-BC game will get underway at 2:00pm Eastern. The game will be available on television in certain local markets and that telecast will also be available online at ESPN3.com and through the ESPN app.